As student enrollment has grown over the last two decades, student needs have significantly increased. Despite the growing diversity, an increasing number of students are taking the ACT while the average score is holding steady. 80% of Oklahoma high school seniors took the ACT in 2015 -- up from 75% a year before. 19% of those tested are potential first-generation college students. From 2011-2015, the number of ACT test-taking graduates increased 9.3%. Oklahoma's average ACT score is ranked 11th nationally among states where at least half of seniors take the test. Are Oklahoma's schools top heavy? That's not what data shows. 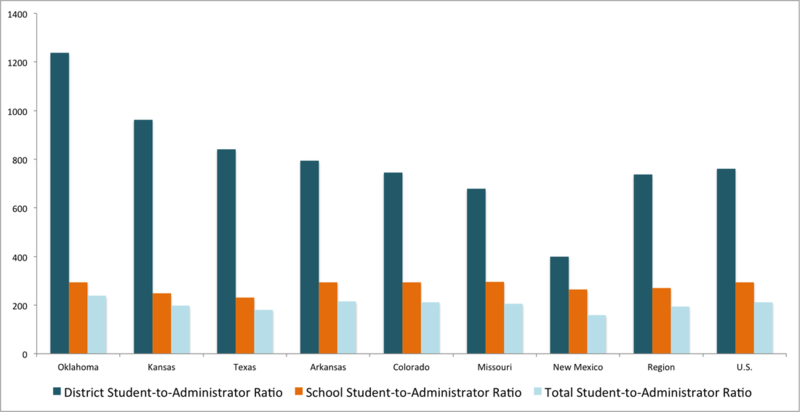 Oklahoma administrators are responsible for more students than most of their peers in other states. In fact, schools have adjusted staffing to meet new mandates and the growing needs of students. Oklahoma ranks 43rd nationally on per-student administration spending. Oklahoma has the highest student-to-administrator ratio in the region. Oklahoma's student-to-administrator ratio is 42nd the nation. Oklahoma could hire 300 more administrators and still not reach the national average. All administration includes superintendents, assistant superintendents, principals and assistant principals. Oklahoma's district student-to-administrator ratio is 43rd the nation and 40 percent higher than the national average. Oklahoma has the highest district student-to-administrator ratio in the region. 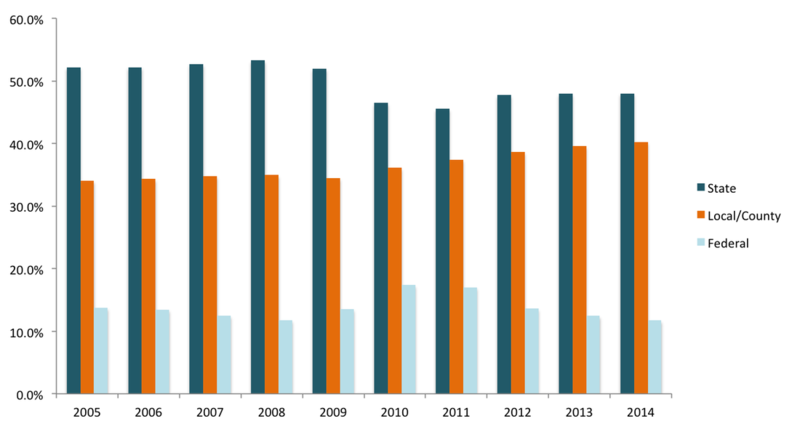 Since 1992, the number of district-level administrators has fallen nearly 14 percent. District administration includes superintendents and assistant superintendents. The school-level student-to-administrator ratio is higher than the regional and national averages. Since 1992, Oklahoma has experienced growth in the number of principals and assistant principals. Oklahoma's per-student spending on school-level administrators is lower than the regional and national averages. School administration includes principals and assistant principals. To meet student needs, public education has shifted its staffing significantly since 1992. 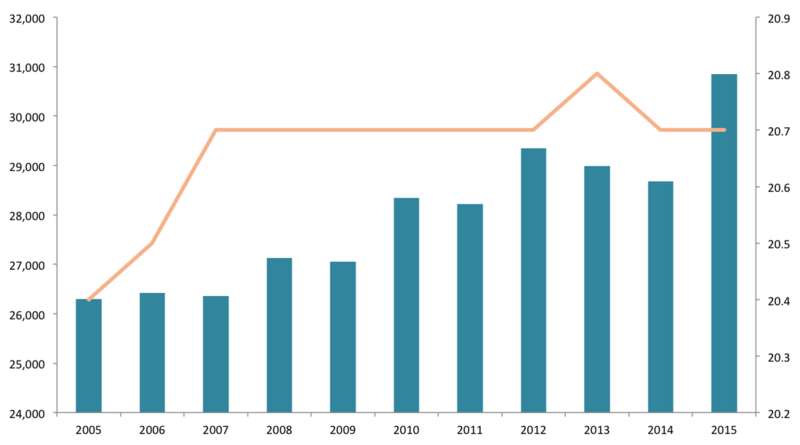 There are fewer district-level administrators despite additional mandates. With the growth in students receiving free lunch, English language learners and children with special needs, schools have had no choice but to add additional employees to provide support. The largest area of staffing growth comes in two areas: instructional aides and support staff who provide direct services to students, including speech pathologists, audiologists and social workers. Schools also face many more mandates -- particularly in the area of testing -- than they did in 1992 that have required growth in some non-teaching areas. Enrollment increases in pre-kindergarten and full-day kindergarten also have increased the need for instructional aides. The amount spent on public education in Oklahoma has grown but isn't keeping pace with enrollment. Common education comprises a shrinking share of the state's budget, and districts are increasingly reliant on local revenue sources. On a per-student basis, Oklahoma's surrounding states are investing hundreds of millions of dollars more in education. State funding for common education is less in FY2016 than in FY2008. Common education funding makes up a smaller share of the state budget than it did in 2008. School districts are relying more on local funding. Oklahoma's neighboring states invest substantially more in common education on a per-student basis. 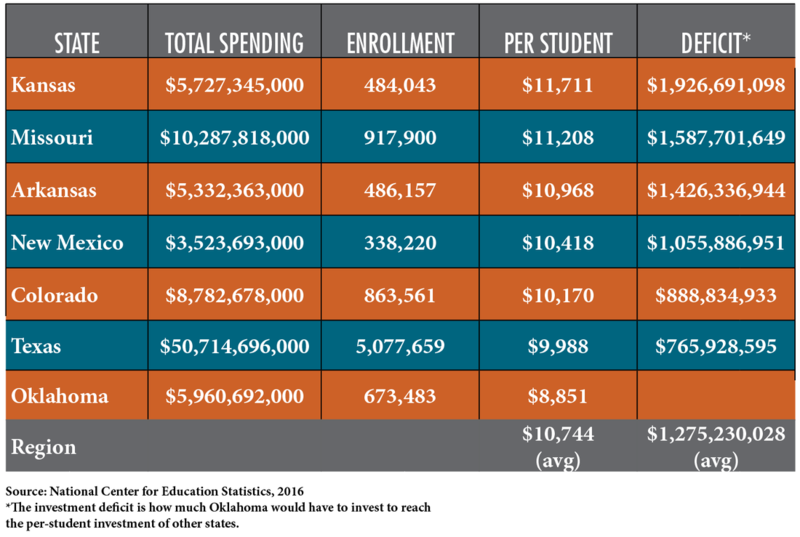 Oklahoma would have to invest nearly $1.3 billion more annually to reach the regional average per-student spending. Oklahoma's average teacher salary, which includes health benefits and the district's retirement contribution, is not regionally competitive. Oklahoma schools are coping with a significant teacher shortage, which has led to increased class sizes and the elimination of some courses. Oklahoma started the school year 1,000 teachers short despite eliminating 600 teacher positions from the prior year. The state Board of Education has issued more than 1,000 emergency teaching certificates this year. About one-third of school leaders said their schools likely will offer fewer courses this school year. 11 out of every 100 Oklahoma teachers leave the state or the profession every year. 17% of new teachers in Oklahoma leave the state or the profession after their first year. 10% of Oklahoma teachers with a decade of experience leave the state or profession every year. Oklahoma is replacing experienced teachers who leave with teachers who are far less experienced. Between 2005-2006 and 2013-2014, Oklahoma had a 24 percent decline in the number of students completing teacher preparation programs. Research has projected that it will further decline 22 percent between 2013-14 and 2018-19. (Student enrollment is projected to continue increasing). Oklahoma is not producing enough foreign language, math or science teachers to replace those who are leaving. 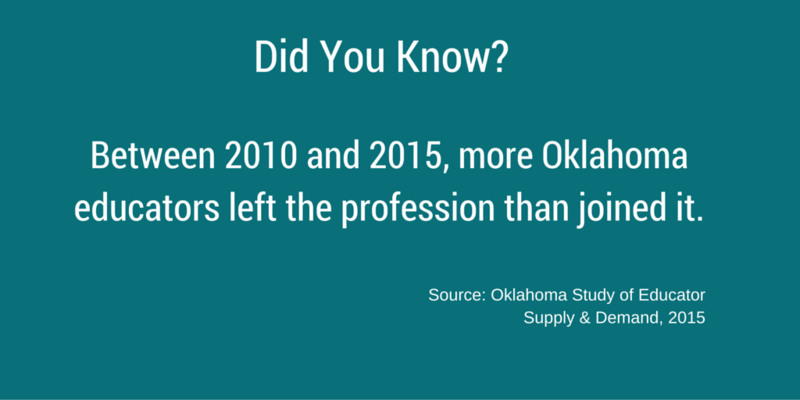 The projected demand for teachers in Oklahoma will continue to outpace the supply. Oklahoma has significant competition from the private sector and from surrounding states. A high percentage of out-of-state students (76%) who completed teacher preparation programs in Oklahoma in recent years never worked in Oklahoma’s public schools. Oklahoma's special education student-to-teacher ratio is almost 23:1.